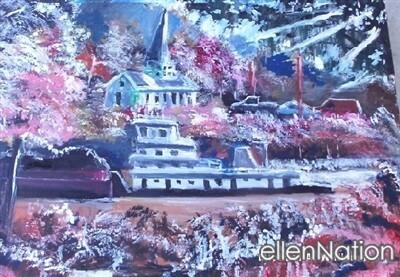 Acrylic on canvas is created by award winning v visually impaired artist Michael A. Williams. Mr. Williams has an eye disorder called Stargardt's and has been sight impaired since birth. The artist has never allowed his disability to get in the way of his dream of becoming a painter and has won several art awards for his painting. In 2016, the artist sent President Obama one of his paintings and received a thank you and letter of acceptance for his art gift to the President. 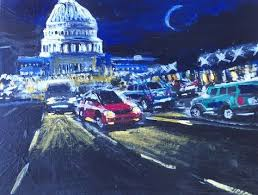 The painting D.C. Commuters has since been sent to Ellen DeGeneres as a thank you gift for her inspirational shows. Artist Michael A. Williams is now working on a non profit called the International Association for Sight Impaired Artists. The organization is in the development of educating and encouraging individuals who are are blind or visually impaired to get involved in both the visual, performance and literary arts.